Netflix has tapped on Instagram to enable users to share shows as an Instagram story, or to send as a direct message. 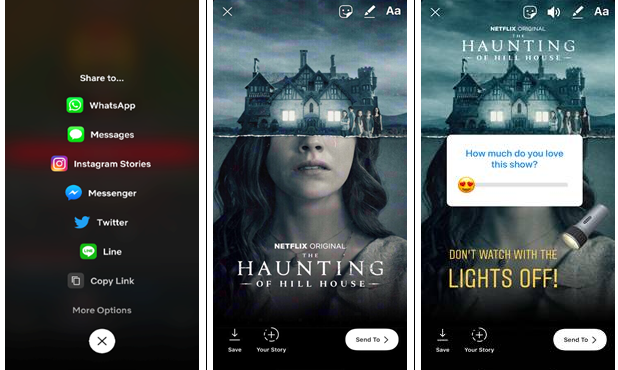 With this new feature, Netflix members can open the Netflix app on their mobile phones, select a title of the show, add that title’s custom art, then share it on Instagram. The story remains visible for 24 hours and provides a “Watch On Netflix” link back to the title page within the Netflix app. Currently, this feature is only available on iPhone, with plans for Android later this year. “We’re always on the lookout for ways to make it easier for members to share the Netflix titles they’re obsessing about and help them discover something new to watch. We hope our members enjoy this new feature!” Leigh Wong, Netflix’s head of communications for Southeast Asia said. He added that this is a global roll out. According to Kim Hoeu, head of paid social at Essence APAC, this is a win-win partnership as users spend more time on Instagram Stories and it drives more eyeballs to Netflix’s shows, creating interest and hopefully leading users to explore Netflix even more. Given that Netflix is now offering more content and titles, indicates that it is also actively hunting for more subscribers and aiming to bring more traffic to its site/app. Many of these shows are also aimed at 13 to 34 years olds and Instagram is a golden opportunity to resonate with that audience. “Netflix is essentially partnering Instagram as a platform to push this digital word of mouth, create excitement around its content, and ultimately generate free advertising for itself. By being exposed to more Netflix content, users will be discovering something new to watch and down the line, this will increase the average time spent on Netflix as well as bring new users — leveraging this younger generation’s FOMO,” Hoeu said. Hoeu added that Netflix should consider extending the service to the Android platform as well as there is a big opportunity to target a large pull of Android users in South America and Southeast Asia who provide the biggest growth potential in terms of Instagram adoption. Calling it a natural extension, Ranga Somanathan, CEO of Omnicom Media Group Singapore & Malaysia, added that people have the urge to share their meaningful experiences with their friends. With this integration, Netflix simply makes iteasier for its viewers to share their favourite shows with their network. From Netflix’s perspective, this drives organic reach and awareness build up for it’s shows. Pradeep Harikrishnan, technical advisor, IPG Mediabrands Indonesia also added that this is a symbiotic partnership as viewers are more likely to share what they are watching on Instagram stories, and so the visibility for Netflix goes up. “The ease with which the feature allows highly engaging content for sharing on Instagram benefits the medium in generating viral content that gets them eyeballs,” he said. PARKnSHOP moves into the mobile space with the launch of its first ever m-commerce app. ..